When he was 32 years old, he bought a boomerang in the toy shop and he took it to the park so that he and his small son could play with it. It was a dull autumnal day and the clouds sat low and grey in the sky but it did not rain. 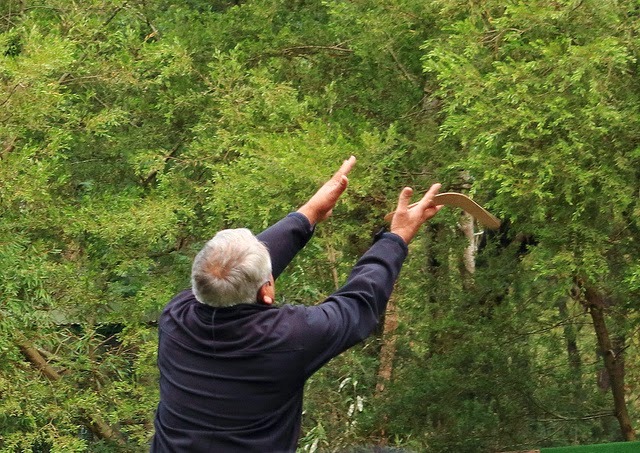 He read the instructions on the side of the package and he grasped the boomerang as the little illustration told him to then he held it aloft and threw it into the sky. His three year old son jumped for joy, not because of the boomerang but probably on account of having the wide green park, and his dad, all to himself. The boomerang described a wide looping angle around the park and something about its movement confirmed that its strange shape was causing it to work against the world in an unorthodox way. It turned and turned and, although it didn’t quite come back, it gave every indication that it wanted to. So he retrieved it and threw it and threw it again and, with each attempt, the boomerang came a little bit nearer to closing the circle that would return it to his hand. The clouds got lower and greyer and the little boy became restive and full of longing for his couch and his TV channel so the man promised himself one last throw, one final all-or-nothing attempt before they finally gave up and went home. There were trees in the park, as one would expect, and, up until that final throw, they had not been an issue. But the man put everything he had into his final attempt and the boomerang looped high and wide such that it seemed to scrape the underside of the lowering clouds. It widened and turned and turned and turned and then it hit the high branches of one of the sycamore trees that bounded the edge of the park. The boomerang swept into the heart of the high tree and became lodged and lost there, beyond sight, beyond retrieval. Man and boy ran and stood under the tree and glared up but the boomerang could not be seen. The rain started and, although the tree offered some initial shelter, the droplets from the leaves above soon cast their own gentler rain on the upturned faces below. It really was time to go home. Time passes in this story as well as everywhere else. The winter came and the leaves went and the man and the boy went periodically and stood under the tree looking up but the boomerang did not show itself to them. The boy didn’t care. In truth he didn’t even remember why they went to the base of the tree, so taken was he with toys and colours and hugs and constant new experiences. He became a regular feature, in the park, under the tree gazing upwards. Even after his son had stopped coming with him, first from boredom and then from girls and college and marriage and children of his own. Still the man came and stared upwards in the hope of some angular silhouette revealing itself to him against the sky. Even in summer, when the leaves were full and impenetrable, he would come and stand and stare. The leaves budded and bloomed and fell and rotted and budded and bloomed. The man’s wife died, of nothing much other than old age. Then the man’s son died of a similar ailment. The man was left alone and older than old but he was still cursed with sensibility and mobility and a keen sense of loss and he still shuffled to the place under the tree where he had always come. He still looked up. On the deepest winter’s day, when the man’s age was far beyond reckoning, he came and stood and he was more alone than anyone had ever been. He looked up, as he had done a thousand thousand times before, and he saw neither angular line nor movement. He fancied that he shouted then, upward into the tree. He cursed the boomerang at the top of his voice, for flying up and leaving him so alone. In his mind he bellowed but, in truth, he was older than old and the noise he made was little more than a whisper. But, in the same way that a butterfly’s wing may cause a hurricane, the man’s whisper caused a stir in the air and the stir moved a leaf and the leaf twitched a branch and an ancient toy, bleached and rotting, dislodged and fell, finally, back to earth. The old man saw it fall. “There you are,” he whispered and he had just completed his thought when the boomerang hit him squarely on the forehead and knocked him, cold, to the ground. He stayed there a while and nobody woke him because it was the darkest time of the year and nobody was about. When he woke, he sat up slowly and examined the boomerang that lay in his lap. Despite the bleaching and the rot, it looked strangely new. Then he realised he was no longer alone. His wife was there, standing beside him, and his son too. They smiled down at him. Oddly enough I didn’t see the punch line coming. A little saccharine for my tastes—reminded me of Mitch Albom (say no more but, hey, the guy sells)—but it works and it’s not as if I haven’t written some pretty awful sentimental stuff over the years. (And by that I mean mine was awful; yours is okay.) I had a couple of boomerangs growing up. None ever came back to me. Story of my life. Try Metro Mums; they took my story ‘The Pooh Brooch’ which is pretty sappy. And they pay. Lisa: Thanks. Thanks for reading. I love the ending - it was a punchline and a wonderful one. This is different from your previous funny or "dark" stories. A collection of such heartwarming stories is something I would like to read- curled up in bed - on a rainy and gloomy day. This was an awesome story! Especially I just loved the character of the sweet little boy!